Clean and wash chicken. Take it in a bowl. Add chilli powder, haldi powder, salt to taste and lemon juice. 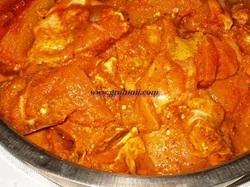 Mix well and leave it for half an hour to marinate. Now add 2 tea spoons of oil, dhaniya powder and garam masala powder to it and cook (either in a pressure cooker for 3 whistles or in a pan) until the chicken is softly cooked. Spread some chopped mint leaves over it and keep it aside. Clean, wash and drain rice, keep it aside. Take a large thick bottomed vessel. Heat 2 table spoons of oil and a table spoon of ghee together in it. Add cloves, cardamoms, cinnamon and bay leaves. Saute and add chopped Onions and green chillies. Fry Until the Onions turn translucent. Add 2 tea spoons ginger garlic paste, stir, fry for few sec. and add the rice to it. Mix well, add 2 cups coconut milk (optional) and 2 cups water (if coconut milk is not added, add 4 cups of water). Add salt, mix well and close the lid. Cook in a medium flame until the rice is 3/4 cooked. Mix occasionally. Remove half of the rice into a bowl. Spread evenly the chicken pieces over the rice In vessel. 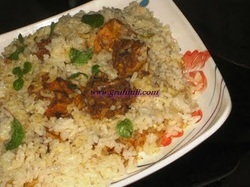 Now cover the chicken pieces with the rice which you have taken into the bowl. Cook for 10 to 12 mins in a low flame until the rice is completely cooked. Switch off the flame and take the Chicken pulav into a serving bowl and garnish with fresh mint leaves.